I tend to think of stew as a uniquely American creation. This may have something to do with the fact that one of the first stews I ever knew and loved was a classic beef variety that the housekeeper at my dad and step-mother’s house used to make for us when I was a kid. Her name was Helen and while I can’t claim to ever having been one of her favorites (she didn’t like my dad or me very much; I think she felt an allegiance to my step-mom’s first husband) it never interfered with my appreciation for her cooking. Helen didn’t prepare a lot of meals for us, but occasionally if my stepmother was pressed for time or working late she’d ask her to make one of the two dishes she did exceptionally well — fried chicken, and this particular beef stew. It’s been more than thirty years since I’ve tasted Helen’s cooking, but what I remember of that stew is chunks of fork-tender meet, big pieces of carrots and new potatoes that were soft but never mushy, and a thick, well-seasoned brown sauce that held it all together. It’s a dish I can’t help but think of each year as the autumn chill sets in. Of course, those childhood memories notwithstanding, America can hardly lay claim as the creator of this particular dish — something I’m reminded of each time I direct my fork towards a serving of boeuf bourguignon or carbonnade a la flamande, both of which are essentially elaborate versions of the meal Helen used to make for us. 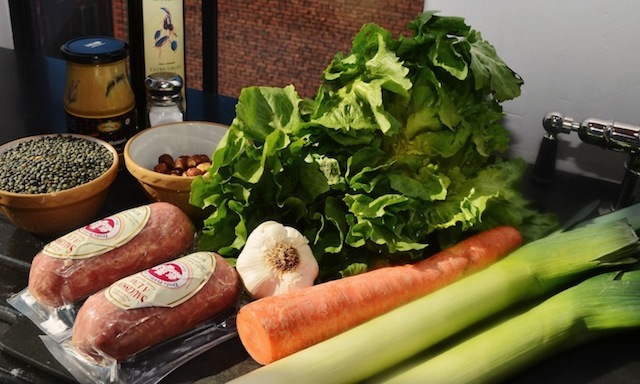 And it’s something that was driven home by the Oct. issue of Food & Wine magazine — a special issue on Gallic cooking that includes a section on simplified French stews by New York Times columnist and cookbook author, Melissa Clark. 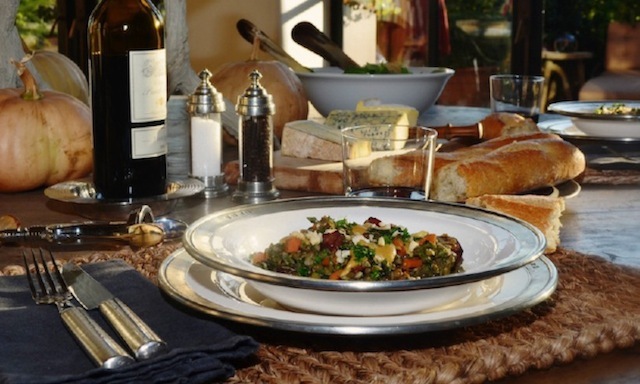 The recipes in the piece include a number I’m eager to try, including Chicken Dijon, and a Provencal Lamb Stew with Basil, but the one that spoke to me the loudest and that I considered for all of a day before rushing out to buy the ingredients was Clark’s interpretation of the classic lentils with garlic sausage stew. I’ve never tackled the traditional version that served as Clark’s inspiration here so I can’t speak with any authority as to how much time and effort is involved in the original, but given the subtle similarities between this dish and a cassoulet (both are thick with beans and studded with garlicky meat — okay, I said the similarity was subtle), I’m guessing plenty. 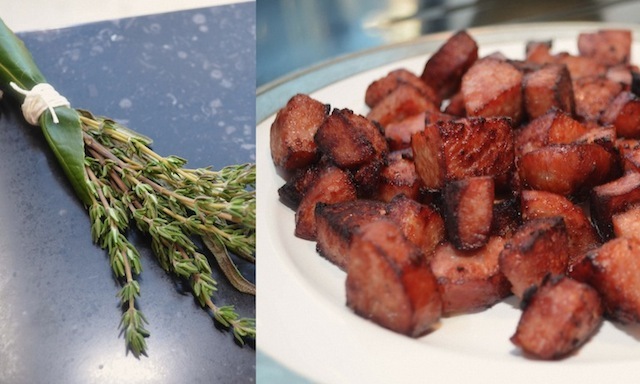 No doubt it’s worth it, with hours of slow braising rewarding the patient chef with the sort of deep, full-bodied flavors that are particularly appealing this time of year. But for those of us who have neither the time nor the interest in manning the stoves all day, Clark offers a simple solution: the addition of a mustard and olive oil mixture just before serving that ratchets up the flavor quotient while keeping the finished dish bright and zesty. The whole thing takes little more than an hour. You start first by browning the sliced sausage (the recipe calls for a pound, though I suggest increasing this by half as I found the finished dish a little light on meat). 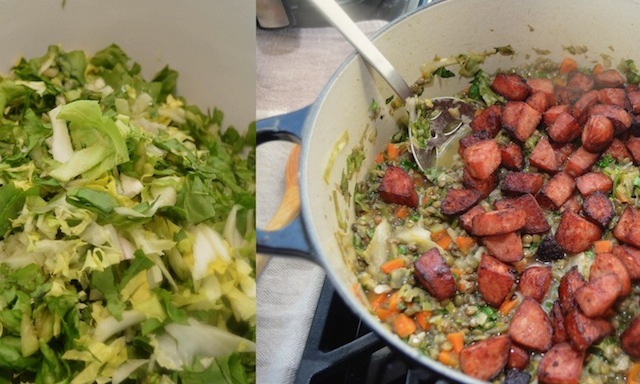 Once this step is complete, the browned sausage is set aside and the vegetables (leeks, carrot, garlic) are added to the pot, followed a few minutes later by the lentils, a quantity of water, and a variety of fresh herbs tied together in a bundle and left to simmer. The recipe suggests a cooking time for this stage of about 35 minutes, but I found that the lentils weren’t quite tender enough for me and so kept them on the stove for another ten minutes. Either way, once this step is complete you add a small head of chopped escarole, let it cook until wilted (about six minutes or so), and then reintroduce the browned sausage until heated through. You’ll be spooning the finished stew into bowls before you know it, marveling at what you created in record time (take that, Jacques Pepin!). But wait, there are still a few final moves — ones that make all the difference! The key to fast-tracking a recipe as Clark has done here is the introduction of a few bright-tasting ingredients towards the end, to compensate for the lack of deep flavoring that can only come with hours of cooking. 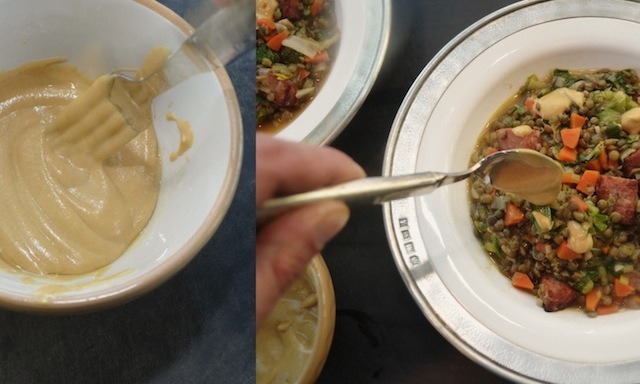 The first involves the addition of some chopped hazelnuts, which also serve as a nice textural counterpoint to the give of the lentils. For this you simply toast a ½ cup of hazelnuts in a 350 degree oven for 12 minutes or so, then rub off their skins with a kitchen towel before coarsely chopping them (all of which can be done while the lentils are simmering). The nuts are then added to each serving of stew, along with a tablespoon of chopped parsley, and a few dollops of the olive oil/Dijon mustard mixture. 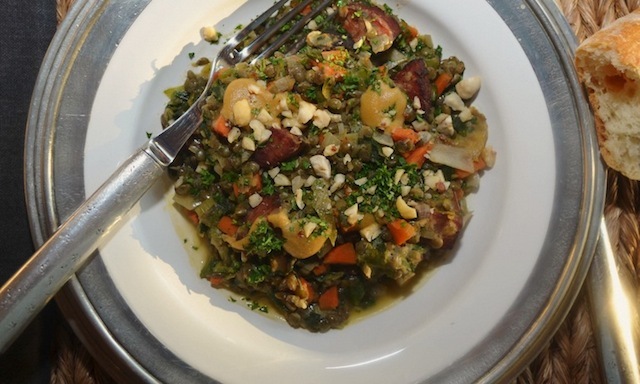 Together these elements (particularly the mustard, which as any meat enthusiast knows has a natural affinity for sausage) ensures that the finished dish will have the sort of flavorful heft you look for in a stew, but with none of the heaviness. Trust me, the results are so good they’ll give you reason to look forward to the next chilly, stew-friendly day. Also, for all my vegetarian friends, try substituting the garlic sausage with a non-meat variety, such as the Italian grain sausage from Field Roast. Just make sure that whichever brand you choose features garlic as a key ingredient — it’s a flavor that’s critical to the dish’s success. *A vegetarian sausage can easily be substituted here, just look for one with plenty of garlic flavor. —In a large, heavy Dutch oven, heat 2 tbs of the olive oil. Add the garlic sausage and cook over moderately high heat, stirring until browned, 5 minutes. Using a slotted spoon, transfer the sausage to a plate. 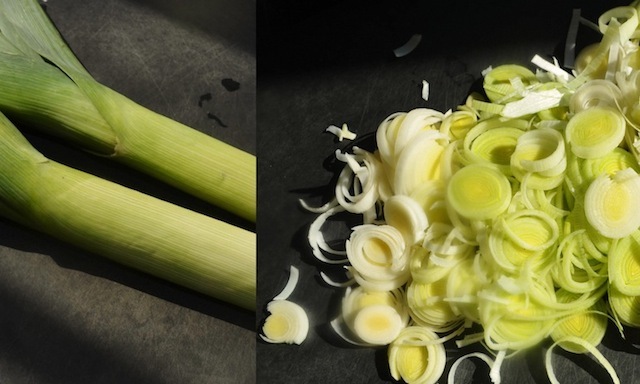 —Add the leeks, carrot and garlic to the Dutch oven and cook over moderate heat until softened, about 7 minutes. Add the lentils, herb bundle and 5 cups of water and bring to a boil. 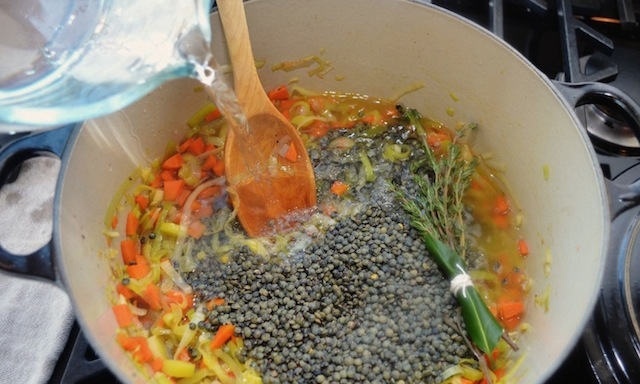 Season with salt and simmer over low heat, until the lentils are tender, about 35 minutes. Discard the herb bundle. —Meanwhile, preheat the oven to 350 degrees. 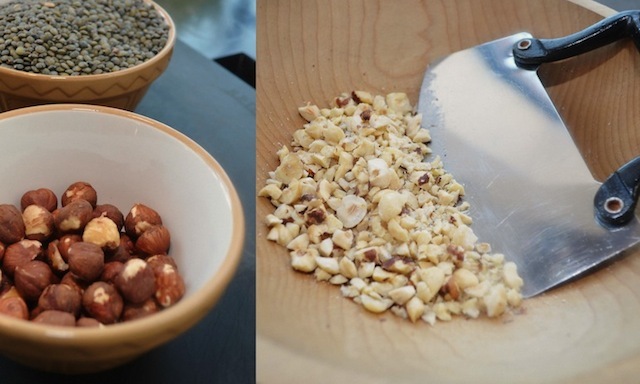 Spread the hazelnuts in a pie plate and toast for about 12 minutes, until golden. Let cool, then transfer the nuts to a kitchen towel and rub off the skins. Coarsely chop the nuts. —In a small bowl, combine the mustard with the remaining 2 tablespoons olive oil. Add the escarole to the stew and cook until wilted, 6 minutes. Stir in the sausage and cook until heated through. Transfer the stew to bowls and drizzle with the mustard oil. Garnish with the nuts and parsley and serve.